DALLAS (AP) Isaiah Thomas used his crossover dribble to create an open 3-pointer that helped his new team build a double-digit lead in the first half. The Los Angeles Lakers couldn’t stay in front in the diminutive guard’s debut following his ill-fated stint in Cleveland. Still, there was plenty of evidence that Thomas can be the scorer he was in Boston. Dirk Nowitzki had a season-high 22 points, Harrison Barnes added 21 and the last-place Dallas Mavericks rallied to beat the Lakers 130-123 on Saturday night. Thomas finished with 22 points and already looks like a better fit in coach Luke Walton’s offense following the deadline deal that brought him from the Cavaliers, who acquired him last summer in the trade that sent Kyrie Irving to the Celtics. Thomas’ first half with the Lakers was his highest-scoring half of the season, a team-high 16 points. Thomas, who was part of a four-player deal at the trading deadline that also brought Channing Frye, missed the first 36 games recovering from a hip injury. Doug McDermott had eight points in his Dallas debut following a deadline deal that brought him from New York and was part of a youthful closing lineup that outscored the Lakers 13-5 in the final 3:09. Nowitzki, Barnes and starting guard Wesley Matthews all sat in the last three minutes, and rookie guard Dennis Smith Jr. put Dallas ahead for good at 119-118 on a layup. Smith finished with 14 points, and the Mavericks had a season high in points. Thomas was out there late for the Lakers, who had a season-best, four-game winning streak stopped for the third time in a month. Julius Randle had 26 points, eight rebounds and seven assists for the Lakers, and Brandon Ingram scored 22 points. Kyle Kuzma had 12 points and 15 rebounds. Dallas’ Dwight Powell scored 19 , two shy of his career high. J.J. Barea had 10 points and nine assists. 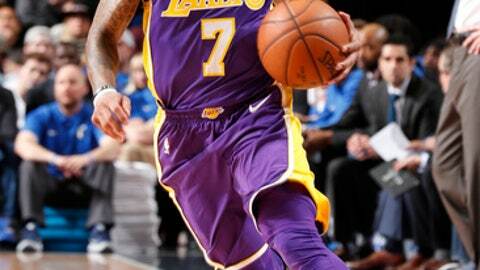 Thomas entered the game midway through the first quarter to a noticeable ovation from the usually solid number of Lakers fans in the Dallas crowd. He hit a 3 from the left wing on his first LA possession and was 4 of 7 from long range before halftime. Lakers: G Lonzo Ball missed his 13th straight game with a sore left knee. … Thomas got a flagrant foul in the second half when he pulled Kyle Collinsworth down by the shoulders when the Dallas guard was going up for a dunk. … Brook Lopez had 16 points, and Kentavious Caldwell-Pope added 14. … The Lakers matched a season high with 16 3-pointers. Mavericks: F Josh McRoberts was waived. He played in two games after spending the first 37 games on the inactive list with a left foot injury. He was acquired with a second-round pick and cash for center A.J. Hammons last summer. … McDermott, who came from the Knicks in a three-team trade, scored his first Dallas points on a breakaway dunk soon after entering the game in the first quarter. The persistent question for Walton will be whether and when Thomas becomes a starter. It was the first Dallas-LA meeting since the Lakers ended the Mavericks’ 14-game winning streak against the storied franchise. The previous longest streak for Dallas was three games. It was just the fifth win of 2018 for the Mavs, who ended 2017 on a season-best four-game winning streak. Lakers: At New Orleans on Wednesday. Mavericks: At Houston on Sunday.